Benefits and efficacy of Eggs For Pregnant Women and Fetus healthy t1ps - Eggs are rich in nutrients that make it a superfood or a super food. Eggs have the essential nutrients consisting of proteins, fats, and minerals that make it a healthy food. During pregnancy, the egg is a healthy food that should be included in the daily diet because the benefits of eggs for pregnant women very much indeed. Eggs are rich in selenium, zinc, vitamin A, D, and B complex needed during pregnancy. So eat eggs during pregnancy will provide some health benefits for pregnant women. But we need to be careful in choosing eggs. Before buying make sure the eggs are new and suitable for consumption. If buying eggs in a cardboard container, should remain in the container and put in the fridge. Eggs are rich in protein benefits that are important during pregnancy. Every cell growth in babies is made of protein, so the eggs with a limited amount during pregnancy is good for the fetus. In addition to the fetus, protein is needed by pregnant women. So these proteins can be useful both for the mother and baby. Eggs also can play a role in brain development in the fetus. The content of the eggs that play a role in brain development, among others choline and omega-3 fatty acids. The content can be instrumental in the overall development of the baby and the health of the brain. It also can prevent neural defects in babies. Pregnant women or mothers who have normal cholesterol levels can consume eggs two eggs a day to get fat needs. If cholesterol owned high then you should avoid egg yolk. So they could consume egg white, egg yolk sedangnya aside. Eggs contain calories needed by pregnant women. Pregnant women should eat foods that contain extra calories by 200 to 300 calories to meet their body's needs and their babies as well. Egg itself contains about 70 calories a healthy diet to provide additional caloric needs at the pregnant woman's body. Eggs contain some vitamins needed by the body. Some of these vitamins include vitamin D, vitamin A, vitamin B2, and vitamin B12. the benefits of vitamin D is good for bone health, while the benefits of vitamin A is good for eye health. Vitamin B2 or riboflavin is one of the vitamin B complex. Vitamin B2 berprean in energy production in the body, the process of growth, and helps the body process oxygen for use in the body. Vitamin B12 or cobalamin function in aiding the metabolism in the body, especially the DNA synthesis and regulation, fatty acid metabolism and amino acid metabolism. Vitamin B12 deficiency can cause damage to the brain and nervous system. Eggs contain folate and iodine which is needed by the body. Folate is beneficial for heart health, prevent stroke, keeping one's mood, and maintaining a healthy colon. Iodine itself useful to control the functioning of the thyroid gland to the body's metabolism. Place the eggs in a cool, dry, ideally in the refrigerator. Eggs should be placed at a constant temperature below 20 C. The eggs should be placed away from other foods. Eating foods containing eggs immediately after served. If not eaten immediately should be stored in the refrigerator. Cakes for example, can be placed in a cool, dry place. If you have a boiled egg that is stored in the refrigerator, the longest stored for 2-3 days. Always wash and dry hands after handling or cooking eggs. Do not use eggs that skin has been damaged because the risk of dirty and contains bacteria that are not good for the body. Cook eggs well and until cooked. A mature egg will be deprived of the bacteria. 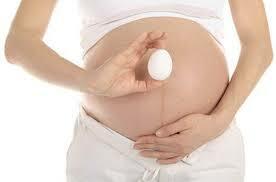 It is very important for pregnant women to eat egg is completely cooked. So for maternal consumption of eggs is quite advisable. Benefits of eggs for pregnant women can be cooked thoroughly and there are actually a lot of eggs in any form that can be selected by pregnant women if it could be with a poached egg and a fried egg. Although good for the body, it still should not be excessive in consuming eggs and other foods.